Agilent Technologies have announced four new handheld instruments that provide convenience on the bench or in the field. Three are handheld capacitance and LCR (inductance, capacitance, resistance) meters that give engineers easy access to component testing. The fourth is a handheld multi-function calibrator/meter that provides two-in-one functionality, equipping engineers for on-the-go characterisation of process-control devices. The new Agilent U1701A capacitance meter and U1731A/U1732A LCR meters let engineers perform quick and basic measurements. Key capabilities include one-touch measurements, tolerance testing (with visual and audible indication), value recording (with minimum, maximum and average), and a dual display. In a factory or in the field, the calibration of process-control devices often requires concurrent measurements with a digital multimeter (DMM). The two-in-one functionality of the Agilent U1401A handheld multi-function calibrator/meter lets technical staff travel light when doing calibration for validation, troubleshooting, or service and maintenance. 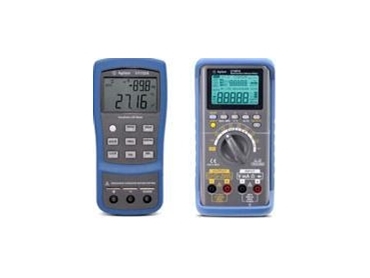 The Agilent U1401A handheld multi-function calibrator/meter features include simultaneous source-and-measure capability, full-span DMM measurement or recording functions, and a backlit dual display.